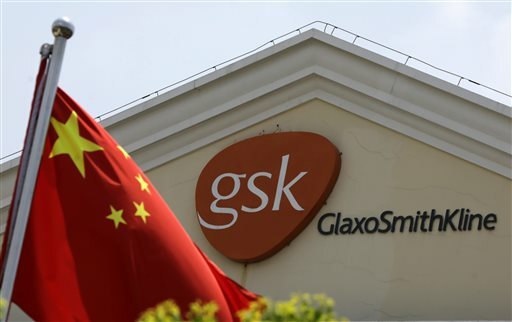 BEIJING (AP) — Drug maker GlaxoSmithKline was fined $492 million on Friday for bribing doctors in China in the biggest such penalty ever imposed by a Chinese court. The court sentenced the company’s former China manager, Briton Mark Reilly, and four Chinese co-defendants to prison but postponed the sentences for two to four years, suggesting they may never be served. The court said it granted leniency because the defendants confessed. The case, first publicized in mid-2013, highlighted the widespread use of payments to doctors and hospitals by sellers of drugs and medical equipment in a poorly funded health system that Chinese leaders have promised to improve. The fine is the largest such penalty ever imposed by a Chinese court. In a statement, Glaxo said it would pay the fine and had made changes in its business to remedy flaws cited by Chinese authorities. It said it would change the incentive system for employees and reduce its engagement with health professionals. “Reaching a conclusion in the investigation of our Chinese business is important, but this has been a deeply disappointing matter for GSK. We have and will continue to learn from this,” said CEO Sir Andrew Witty in the statement. Reilly was sentenced by the court in the central city of Changsha to three years prison with a four-year reprieve and was ordered deported, which meant he might leave China immediately. His co-defendants received prison terms of two to four years, with reprieves of two to four years. In other cases, convicts have been spared prison if they are deemed to have reformed during their reprieve. The police ministry said in May that Reilly was accused of operating a “massive bribery network.” It said Reilly ordered salespeople beginning in January 2009 to pay doctors, hospital officials and health institutions to use GSK’s products. Glaxo had said earlier the employees acted without its knowledge and violated its policy. Such informal payments pervade China’s dysfunctional health system. Low salaries and skimpy budgets drive doctors, nurses and administrators to make ends meet by accepting money from patients, drug suppliers and others. The Glaxo case brought the flow of illicit money to international attention, but within China the practice is common knowledge. Many blame a system in which China’s hospitals nearly all are state-run but get too little money from Beijing. Most of the country’s 2.3 million doctors are hospital employees and are barred from adding to their income by taking on second jobs. Doctors and other employees accept money to move patients up waiting lists for surgery or to use more expensive drugs. Bribes can distort treatment by encouraging overuse of expensive drugs or procedures. The ruling Communist Party has promised higher health spending as part of efforts to spread more of China’s prosperity to its poor majority. But with a population of 1.3 billion, the cost of a full-scale overhaul will be daunting. GSK had announced in June 2013 that it conducted a four-month investigation of allegations its sales staff in China were bribing doctors and found no wrongdoing. The company said it acted on an anonymous complaint. Just three weeks later in July 2013, police announced accusations that top GSK managers in China had carried out a lengthy and widespread campaign of bribery. Almost immediately, the case took a bizarre turn when two private investigators who worked for Glaxo, a Briton and an American, were detained on charges of illegally trafficking in personal details about Chinese citizens. Authorities gave no indication the cases were connected. GSK said the investigators were hired to look into a security breach, not bribery. British news reports cited a note from the Briton, Peter Humphrey, to friends that said he found during his investigation that the bribery accusations were true. Humphrey and his partner and wife, Yingzeng Yu, were sentenced last month to 2 ½ and two years in prison, respectively. GSK announced in December 2013 that it would stop offering financial support to doctors and other health care professionals to promote its products. The police investigation found that GSK employees funneled as much as 3 billion yuan ($490 million) through travel agencies and consulting firms, which kicked back some of that money for use as bribes. Police have not made clear how much was paid out in bribes. Investigators said the scheme appeared to be aimed at evading GSK’s internal controls meant to prevent bribery. A second foreign drugmaker, AstraZeneca, said in July 2013 that police in Shanghai were investigating one of its salespeople. In a separate case, China’s biggest drug distributor, Sinopharm Group Ltd., said in January that two former executives were the target of a corruption investigation.